All scientists and clinicians with an interest in Multiple System Atrophy, atypical parkinsonism and synucleinopathies are welcome to attend the 5th International MSA Congress in Salerno, Italy – April 22-23. The Multiple System Atrophy (MSA) Coalition today announced their sponsorship of the 5th International Multiple System Atrophy Congress (IMSAC) to be held in Salerno, Italy on April 22-23, 2016. The 5th such congress devoted entirely to the topic of Multiple System Atrophy, 21 international specialists representing 10 countries have been invited to lecture on the latest findings in the quest to cure this rare and fatal neurodegenerative disease. Multiple system atrophy is gaining increasing attention as an important cause of parkinsonism, autonomic failure and cerebellar ataxia resulting in major morbidity and mortality. It has also recently gained considerable interest as a model disease of neurodegeneration and may yet prove to offer important clues in the search for disease modifying treatments for Parkinson’s disease or Alzheimer’s. Congress topics to be presented will include neuropathology, genetics, prions, biomarkers, MSA mouse models and MSA symptom management. A keynote lecture entitled “Rational approaches to experimental therapies in MSA” will be presented by Professor Wassilios Meissner (Bordeaux,France) on April 22. 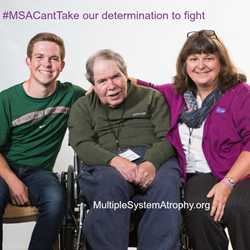 What is MSA?What is multiple system atrophy?